We make excellent provision for the health of our children. The school menus are healthy, well balanced and use fresh ingredients. Our children learn the importance of a healthy diet through the curriculum. All children enjoy a variety of free fruit and vegetables each day, and are encouraged to drink water regularly. Our children have many opportunities to be engaged in physical activities throughout each day; daily Wake & Shake Sessions, Year 2 weekly Swimming Lessons, Active Playtimes & Lunchtimes, an Adventure Play Area, Tyre Parks, After School Multi-Skills Club, Gilmour Football Club, our own Sports Coach for Curriculum and Lunchtime Activies, daily Playing to Learn Sessions & Sports Days. 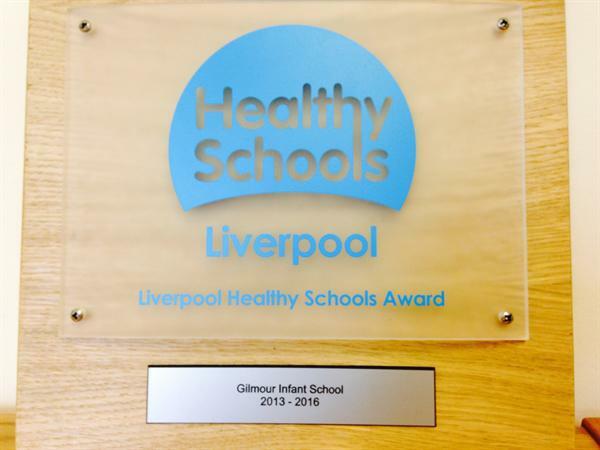 We have achieved The Liverpool Healthy Schools award in recognition of our provision.